Olympique Lyonnais is pleased to announce that negotiations conducted exclusively with Groupama Rhône-Alpes Auvergne from 29 June, have concluded with a modern and innovative global partnership agreement. Groupama Rhône-Alpes Auvergne has been OL’s major partner for several years: for the men’s, women’s and youth teams; also for the naming rights to the training centre (GROUPAMA OL TRAINING CENTER), and for the youth training academy (GROUPAMA OL ACADEMY). During this period, yet another dimension was embarked upon with a partnership that encompasses the naming rights of the Olympique Lyonnais stadium, which will henceforth be called ‘Groupama Stadium’. This deal also includes the establishment of a commercial centre. The naming rights contract is set to be renewed every three years and will create greater exposure for the Groupama Stadium brand via the signage on the stadium’s exterior, its interior, along the VIP passage and that of the broader public, as well as the training areas. The deal will also allow Groupama Rhône-Alpes Auvergne to use the stadium’s image to promote its goods and services. Groupama Rhône-Alpes Auvergne is sure to do well from this scenario, which includes hosting events throughout the year at the Groupama Stadium. The deal will also include some serious commercial development reciprocity between Olympique Lyonnais and Groupama Rhône-Alpes Auvergne, which will help realise some long-term, high-end economic goals. 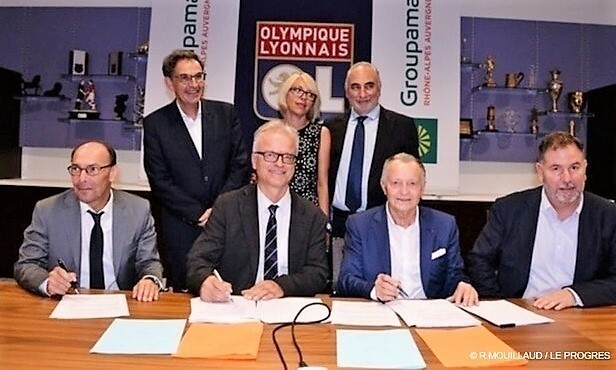 This longstanding, local connection between Olympique Lyonnais and Groupama Rhône-Alpes Auvergne is set to be reinforced and consolidated by these new horizons. Mutual group, GROUPAMA, comprising 580,000 members, 2,000 contractors and 5,800 local electees from 12 departments. General insurer, Groupama Rhône-Alpes Auvergne, leader in agriculture, localised authorities, and significant household, business and craftsperson insurer. This business provides a service via a discrete distribution network that comprises 320 conveniently located agencies as well as four connectivity-enabled, mobile agents. 2016 turnover was in excess of €1 million.